Crit Chicken Pattern for Sale, and more Store fun times! You may have noticed the new banner at the top of my site. I have a store at store-envy and I’ll be placing my pre-made art, charms, magnets and sketchbooks there. It makes it easier for you to buy, and makes it easier for me to sell things to you. I won’t be going to any conventions this year, so this will be the best way to pick up some goodies. I am also open for commissions if you want to drop me a line. 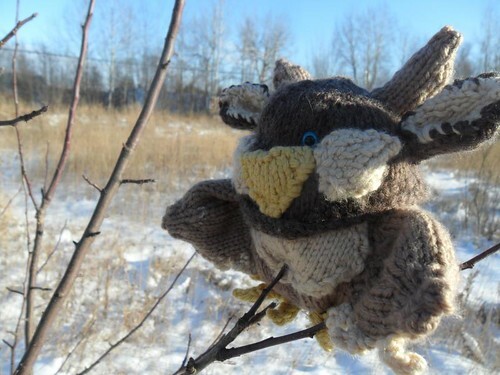 The big announcement is that the moonkin pattern is for sale! 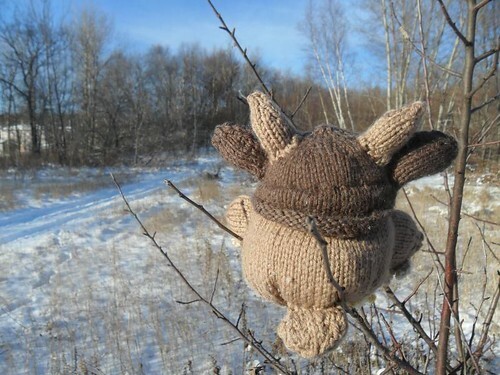 Knit yourself a friend. Ravelry is probably the easiest way to buy, because you get automatic delivery of the pattern, but I thought I would add it in other places, too! Go forth and knit, my fine feathered friends! Crit Chicken Knitting Pattern – coming soon! This took a long time to write, I wrote it as I went along with a test knit, then I typed it up and did the test knit you see posted here. I’m excited! So, this was my first prototype. it was based off an existing pattern but I didn’t like it so much, so I decided to write my own. I’m almost done the test knit, these photos are a little old. I have finally gotten the wings sorted out (It only took me five tries, I ended up going with short, fat wings, so they’re a little different than the shape on the drawing below) so when I have time in my busy schedule of studying and trying not to be a complete and utter hermit, I’ll be finishing it off.